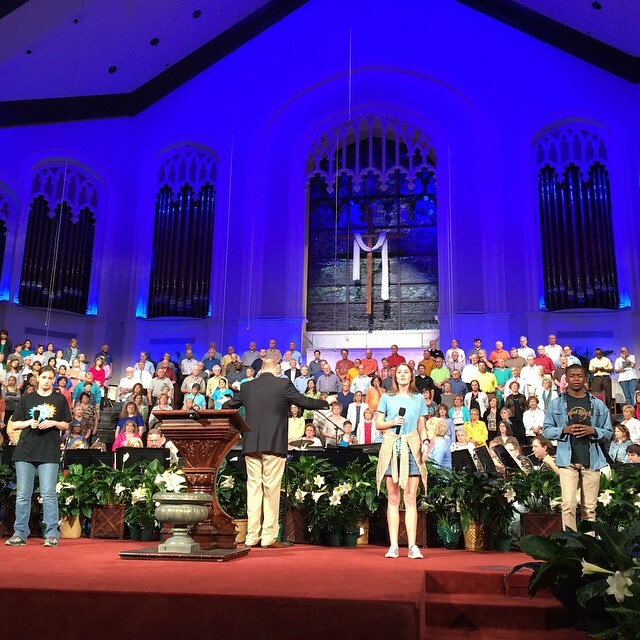 Wednesday night, the Worship Choir and Orchestra were preparing for Resurrection Sunday at First Jackson. You might ask: “What was different this week?” The answer – Worship Happened. It wasn’t rote. It was for real. At first glance an onlooker could have thought we were just caught up in the moment. First Jackson is blessed with some pretty talented musicians – vocal and instrumental. But it was more. So. Much. More. I have experienced this before – this really special kind of worship experience when you know in your heart that the people in the room – musician and listener – get it. I mean really get it. As in – eternally get it. In 2005 when the (then) Sanctuary Choir served in St. Petersburg, Russia, for a week of musical missions, there was a Sunday evening at Central Baptist Church like this. We had been cautioned (warned) by the local IMB missionary that we should not be surprised if there was no response emotionally or otherwise from the congregation. That Sunday morning we sang in that same church and it was like “why are we here?” That night, though, oh my. The song then – Days of Elijah. Like Elijah, we are required to stand up for God. And as we were singing, a lady in the balcony to my left – on the back row – slowly stood. You could tell from watching her, she got it. Slowly, the church came to its feet – like a light cast across a dark room – they – we – worshipped. Understand we were singing in SOUTHERN ENGLISH. Most of them spoke no English and we certainly spoke no Russian. A God Thing. It was celebratory. It was fun. It was exciting. It was humbling. It was God honoring. It was worship. When the service was over, we stood around for a long time sharing fellowship with our new friends in Christ. We knew “they got it”. Frankly, for the first time as a group, we knew “we got it” as well. Wednesday night was sort of like. It happened, however, in the Sanctuary at First Jackson. Another God thing occurred. You could sense something when we rehearsed a new arrangement to Arise My Love. We moved on to rehearsing Untitled Hymn (Come to Jesus), Forever, Christ the Lord is Risen Today. And then – We Believe – “We believe that He conquered death; We believe in the resurrection; And He’s coming’ back again, we believe.” Strong stuff. Solid message. Truth shared. Reassurance. H.O.P.E. The awesome part – it was obvious we believed what we were singing. I saw emotion and response from people in the choir who seldom (never) change their facial expression. It was amazing. It was humbling. It was worship. I did not think it could get any better unless Jesus came right then. I.was.wrong. This Blood – I know this song – have heard it before several times but it never registered. This time it did. And it registered with the 200+ people in the choir loft. You saw it and heard it and experienced it: “There is a grave that tried to hide this precious blood that gave me life. In three days, He breathed again and rose to stand in my defense.” And because of that I am coming to tell you “He’s alive” and “to shout and to proclaim He’s coming back for you.” Listen to it. Meditate on it. You see, when Jesus rose from the grave and appeared to the disciples, Jesus first greeted them and then charged them: John 20:21 “Peace be with you! As the Father has sent me, I am sending you.” That charge still applies to His children. Pray that on Sunday morning in that room, that those there “get it”. My prayer is that revival just breaks out. God knows we need it. He sent us to tell others. It is the only thing that matters.